(Newser) – For spaceflight, recycling appears to be the way of the future: SpaceX scored an impressive first on Thursday with the launch of a previously used rocket. The Falcon 9 booster, which was first launched for a mission in April last year, sent a communications satellite into space before returning to a SpaceX drone ship in the Atlantic to be used again in the future, the Verge reports. 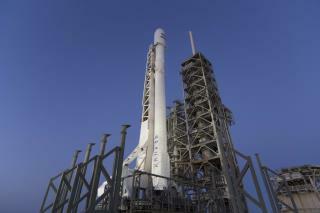 SpaceX founder Elon Musk called the successful launch "an amazing day for space." "It means you can fly and re-fly an orbit class booster, which is the most expensive part of the rocket," he said. "This is going to be, hopefully, a huge revolution in spaceflight." NASA did this in the 80's with the space shuttle. Why is this news? Very good. I'm happy for them.